I’m thinking a lot about life’s lessons these days. Last year I witnessed the death of my mother after a quarter century battle with Parkinson’s disease. At present I am tending to my ailing father. Yesterday a letter arrived in my e-mailbox sent by a friend. It contained this powerful meditation. I hope you enjoy it as much as I did. It certainly rings bells for me. “One morning I wasted nearly an hour watching a tiny ant carry a huge feather cross my back terrace. Several times it was confronted by obstacles in its path and after a momentary pause it would make the necessary detour. At one point the ant had to negotiate a crack in the concrete about 10mm wide. After brief contemplation the ant laid the feather over the crack, walked across it and picked up the feather on the other side then continued on its way. I was fascinated by the ingenuity of this ant, one of God’s smallest creatures. It served to reinforce the miracle of creation. Here was a minute insect, lacking in size yet equipped with a brain to reason, explore, discover and overcome. But this ant, like the two-legged co-residents of this planet, also share human failings. 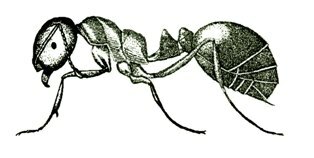 After some time the ant finally reached its destination – a flower bed at the end of the terrace and a small hole that was the entrance to its underground home. And it was here that the ant finally met its match. How could that large feather possibly fit down a small hole? Of course it couldn’t, so the ant, after all this trouble and exercising great ingenuity, overcoming problems all along the way, just abandoned the feather and went home. The ant had not thought the problem through before it began its epic journey and in the end the feather was nothing more than a burden. Isn’t life like that!